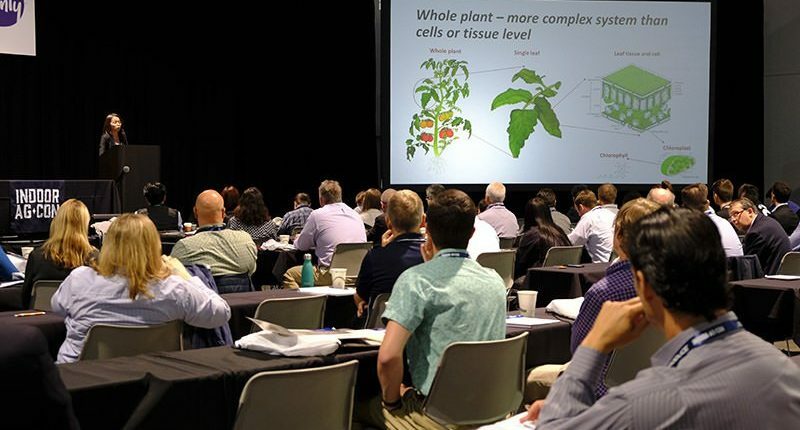 Attend an upcoming Indoor Ag-Con event if you are looking to learn about new technologies and network with the key players in the indoor agriculture industry. When Nicola Kerslake, founder of Newbean Capital, started Indoor Ag-Con in 2013, she was interested in becoming a provider of capital to the indoor agriculture industry. “Part of the rationale for starting Indoor Ag-Con was to learn the industry, to figure out who makes up the industry, who has interesting and promising technologies and what projects we could fund,” Kerslake said. “We define indoor agriculture as using hydroponic, aquaponic and aeroponic growing techniques in warehouses, greenhouses and containers. We try to be as inclusive as possible. We consider projects as simple as using hoop houses to the most sophisticated plant factories. Indoor Ag-Con includes two-day annual events hosted in Las Vegas in the spring, and Singapore in the winter. “At this year’s Singapore event in January we had people from 20 countries,” Kerslake said. “Las Vegas would be similar in terms of attendees participating from a number of other countries, including folks from Australia, New Zealand, Canada, Mexico, a large number of Europeans, particularly Holland, the UK, Belgium and Germany. Indoor Ag-Con was held in Las Vegas, N.V., in May and drew attendees from the United States as well Australia, New Zealand, Canada, Mexico, and several European countries. Kerslake said there were several reasons that Singapore was chosen as one of the locations to hold Indoor Ag-Con. Another reason for choosing Singapore is government officials have been extremely supportive of Indoor Ag-Con. Enterprise Singapore, which was formed in April 2018, is affiliated with the country’s Ministry of Trade and Industry. Kerslake said the participants who attend Indoor Ag-Con events come from a wide background of interests. “About a third of the audience is growers,” she said. This could be a guy who is servicing local farmers markets all the way to some of the largest growers in the world. Another third is what we call “tech geeks.” These would include companies that are supplying equipment to the industry and have been for several generations. But it also includes someone who may have invented something in his garage who is trying to find partners or is looking to find a pilot project. One of the things that we really like about our events is that we see people come with an idea and then come back the following year having found partners and distribution for it. Chris Higgins (center), general manager at Hort Americas, talks with attendees at Indoor Ag-Con in Las Vegas. While Indoor Ag-Con attendance is largest at its major events in Las Vegas and Singapore, it has also held smaller events in Los Angeles, Philadelphia and New York. “Each of our venues has capacity restrictions,” Kerslake said. “At the Las Vegas events we will have an attendance of around 600. Our East Coast events, which are usually capped at around 130 people, sell out quickly. This November we are collaborating to do a Pop Up Indoor Ag-Con during Edible’s FoodLovesTech in Brooklyn, N.Y., which is expected to draw around 2,000 people. This is the first time that we have done a conference during another group’s event. This conference will be more about New York food and the New York food eco system. We will have speakers from AeroFarms, Bowery Farming and Square Roots. This is a great opportunity for us to be able to introduce our conference to a different audience. When choosing speakers for the conferences Kerslake said she is not only looking for people who are knowledgeable about the industry, but have not spoken at events before. Mark Freeman, who is senior manager of global dining services at Microsoft, spoke at the Indoor Ag-Con in Las Vegas. “We start with a long list of potential speakers,” she said. “We are trying to find the newest, most interesting topics and we want someone who is attending to get a good grounding in the industry as well. We are also trying to have speakers who are not necessarily the ones that people expect. For the upcoming Indoor Ag-Con event in Singapore, Kerslake said the conference will cover three different areas. The third area of focus will be entrepreneurship. One of the speakers at the upcoming Singapore conference will be Eri Hayashi, who is director of international relations and consulting at the Japanese Plant Factory Association. Indoor Ag-Con will also be introducing an unconferencing section at its upcoming events. Indoor Ag-Con has collaborated with Enterprise Singapore, which has put up S$150,000 to sponsor prizes for Indoor Ag-Ignite, a pitch competition open to entrepreneurs worldwide. Started in 2018, the competition has been expanded for the 2019 conference. ”We are looking for technologies that come from across the world,” Kerslake said. “The pitch application is now online so anybody can apply from anywhere. Applications are due Dec. 10. This is not only a way for someone to receive major funding for their idea, but it is also a great way for them to gain some exposure in the industry. “We expanded the 2019 competition to include travel stipends. The five finalists will receive a travel stipend to come to Singapore where they will pitch their ideas on the main stage at Indoor Ag-Con. Each of the three winning entrepreneurs will receive S$50,000. For more: Indoor Ag-Con, (877) 609-6202; hello@indoor.ag; https://indoor.ag. This article is property of Urban Ag News and was written by David Kuack, a freelance technical writer from Fort Worth, TX.